Description: NYNE is a Hamilton based clothing brand that is stocked in 30 boutiques around New Zealand. Asymmetric shapes and fluid fabrics lend themselves to an uncomplicated layering of pieces. Collections are highly tactile, using tonal colour and texture to create a distinctly moody aesthetic and a skillful blend of contrasts – hard vs. soft, light vs. dark. This project was done while studying at WINTEC where we were given the brief of creating a new campaign name, campaign poster, lookbook poster and four postcards for the 2010 summer range. We were given NYNE's Logo and the exclusive use of their photographs to work with. The campaign name 'Simply Deconstruct' was based on the seasons clothing having very simple pieces, but in a very modernist, deconstructed way. This inspired the design concept of chopping up the photographs in a simple grid and arranging them in a deconstructed layout. 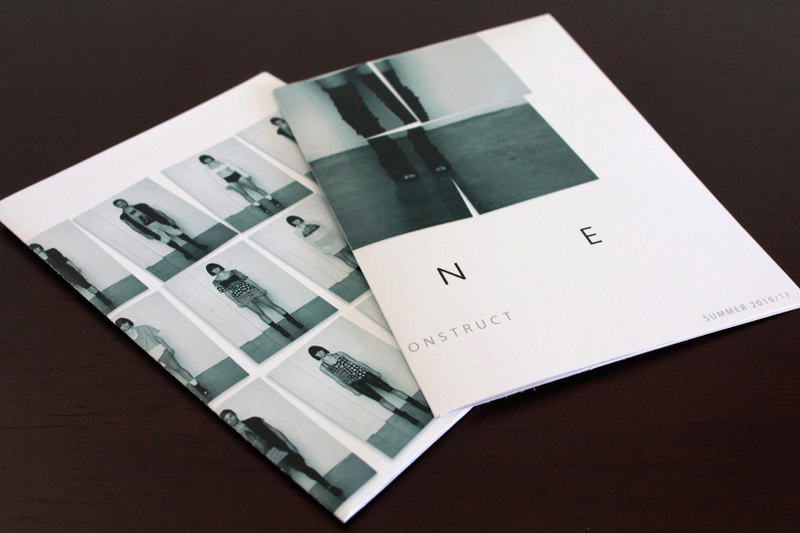 I chose to maximise negative space in my designs to keep within the feel of NYNE's existing branding.